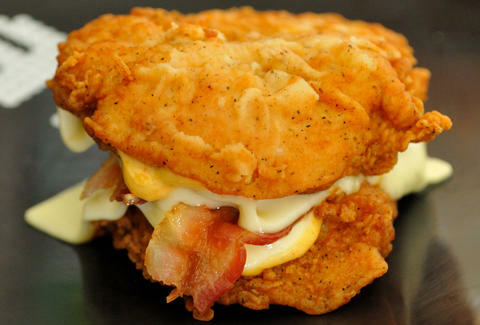 After a brief, furious return last year, the Double Down has once again gone into the KFC vault. But just because you can't eat the cult sandwich doesn't mean you can't... smell it. The peeps at Kentucky for Kentucky are gearing up to drop a line of "nostalgic" state-themed scents which includes the world's first known Double Down candle. Starting tomorrow at 10am, Kentucky for Kentucky will sell its eau de KFC online. The candle features layers of fried chicken-scented wax mixed with "bacon pieces" and a bacon-smelling center. It's just one of four candles in the company's KY pride collection, which also includes mint julep, fried chicken, and Hot Brown candles. Collect all four for the most confusing blend of smells since you wandered into that Yankee Candle store with a fresh Crunchwrap in tow. Kristin Hunt is a Food/Drink staff writer for Thrillist, and prefers lemongrass candles. Follow her to square scents at @kristin_hunt.